The Obama administration is finally abandoning their endorsement of chained CPI for next years budget. The reason is probably not good economics, but political. Election season is near and this is just one of many policies the Obama administration endorsed which raised the ire of the retired. A refresher, chained CPI is another method to adjust for cost of living increases at a reduced rate than what is currently used, CPI-W. Chained CPI would have reduced social security benefits Below is a graph showing just how much lower the adjustment would be over time. Yet the politics might be hoodwinking the American people again for chained CPI might be negotiated in a back room deal. That's the problem with budgets. What eventually is passed by Congress has little to do with the original. Yet to capitulate before the first ball is thrown in the game has outraged groups who normally would be Obama supporters. Now they rave and praise when the deal has yet to be done. 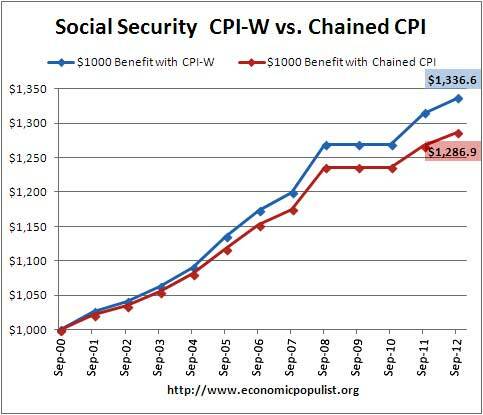 Only time will tell if chained CPI is really gone and the threat to reduce retirement benefits along with it. Yet finally, the Obama administration is not throwing in the towel before the first bell has run in the budget battle opening round. The Obama administration budget is finally promoting policies that might actually work to help the middle class. Beyond dropping chained CPI, there is $50 billion for infrastructure projects, $1 billion for 45 new advanced manufacturing technology centers and a 9% increase in research and development funding. The Department of Defense on the other hand is planning on shrinking the U.S. army to pre-WWII levels. Considering the nature of defense today and the huge chuck defense takes out of the national budget, this might be a good thing. Yet the amounts proposed are greater than current levels so the reduction in armed forces doesn't mean the Pentagon is really tightening their belt. For the five-years ending in 2019, the Defense Department’s budget forecast includes $115 billion more in spending than currently authorized in congressionally mandated levels under the budget cuts called sequestration. The plan calls for requesting $535 billion in 2016, or $35 billion more than the sequestration level; $544 billion for 2017, or $31 billion over the cap; $551 billion in 2018, or $27 billion over the cap and $559 billion in 2019 or $22 billion over the cap. In addition to the $496 billion budget, Hagel urged Congress to approve $26 billion for the Pentagon as part of a $58 billion package that Obama is preparing. Other aspects of Obama's budgets include: the Buffett tax rule, which requires those earning more than $1 million per year to pay at least 30% of their income after charitable contributions in taxes. The budget also calls for those in the top 2% of income earners to pay a 28% tax rate by closing deduction loopholes. Additionally the Obama administration wants to significantly limit the amount of tax deferred retirement funds for higher income people. We can bet these tax agendas will not pass and will be fought against tooth and nail by the GOP. The Obama administration proposes vastly expanding the earned income tax credit for those low income workers who do not have children. This is a bit of luck since typically adults without children who are broke are thrown to the wolves in this country. The administration also plans for a 1% pay raise for all federal workers and military personnel and assuredly the 2.1 million federal workers are cheering after suffering under a three year pay freeze and sequester temporary layoffs. We can finally, at least, say death to the grand bargain on the budget, which was no bargain at all for America's working and middle class people. Obama's budget will no doubt be mangled and roadblocked and the GOP is already livid about chained CPI not being part of the budget while the Progressives, socialists, populists, unions and retirees cheer. The actual formal 2015 White House budget will not be released until March 4th. The budget is clearly political, aimed at the 2014 election. Yet one must wonder if the budget is designed to get votes and these policies are most popular, why then can't a budget which most of America wants get past Congress? Isn't that still the real issue, why is it the American people cannot get the real representation they voted for? Chained CPI assumes that when prices rise, people switch to cheaper products—like switching to dog food from people food. Even if the Buffett Rule passed, 30% is still less. And the top 0.01% still pays no Social Security taxes on their capital gains. Members of Congress pays a tax rate on 28% on their $174,000 salaries; and they also have their Social Security taxes capped at $113,700 —so they don't pay this tax on 100% of their wages like 95% of all other wage earners must do. So long as the capital gains tax is lower than the corporate tax, the CEOs will keep funneling as much profits as they can into tax deductible stock-option grants for the corporate execs. substitution is in CPI already. Chained CPI is a tabulation method. a geometric averagin vs. an arithmetic average. This is stunning and wonderful news, IF he actually does it.